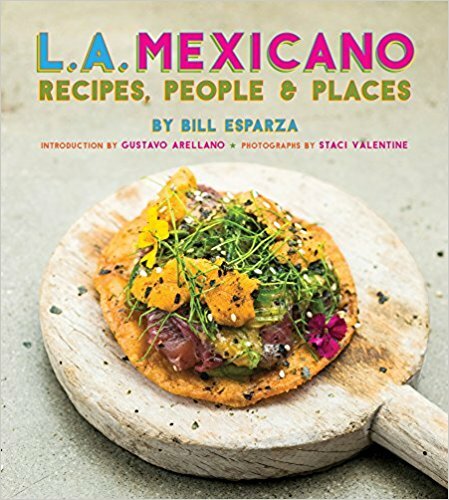 Currently, there are three culinary movements going on in northern Baja:Baja Med- a fusion of Asian, Mediterranean, and local Mexican influence,Wine Country cuisine from Jair Tellez's Laja focusing on local products of Baja in an author's cuisine fashion, and the evolutionary Mexican cooking of Benito Molina, a Mexico City haute cuisine master armed with the amazing bounty of Baja and pure genius.It's a pretty amazing time to dine in Baja. It's not often that you can witness a culinary new movement in action, let alone three. Baja Med is a creation of La Querencia chef Miguel Angel Guerrero, but the roots of this movement are penetrating. The first plantings of wine grapes by Jesuits in 1791, the establishment of Santo Tomas winery in 1888, and the arrival of the Molokanes(Russian immigrants, pacifists fleeing the Czar)in 1904, who expanded the wine grape planting in the Valle de Guadalupe.Italians, French, and Swiss immigrants have flocked to the Valle de Guadalupe over the years bringing their wine heritages in tow. The 80's brought boutique wineries, and Hugo D'Acosta's Casa de Piedra and wine school have raised the bar and technique for quality wine and excellent wine makers. Many dishes in the genre were already forming, Alex Cardini's Caesar salad in 1924, the emergence of Puerto Nuevo style lobster devoured by hungry tourists, and the chorizo de ablulon from the Isla de Cedros, abalone was preserved in chorizo so they wouldn't spoil waiting for the merchants to show up to the island. Ensenada's famous fish taco remains a symbol of Baja tradition that has attained a worldwide popularity. The treasure of seafood, wild game, produce, cheese from Real del Castillo, olives and olive oils,and wine have also formed the various culinary movements in Baja California. The Baja Med Pizza Co. closed but the pizzas are alive and kicking at Miguel Angel Guerrero's El Taller. At Baja Med Pizza Co. in Tijuana, affiliated with La Querencia, a new Mexican identity is being formed in pizza making.An original thin crust topped with a pure of black beans. Toppings include the mouthwatering chorizo de abulon, locally raised lamb, and machaca of marlin. Armando Medrano, the owner, will pair some of his excellent selection of Baja wines with your pizza of exotic toppings. Seeing his young line cooks, fresh from culinary school is comforting. Many of the top restauranteurs have young aspiring cooks that promise a future for Baja Med cooking. Other restaurants continue to surface in the Baja idiom throughout the peninsula. The ill-fated Baja Kuche, which roared coming out the gates, died with a whimper, the young chef presented stylized food with no flavor or substance. But seeing the wonderful menu at the time we were there was inspiring. There are others that are showing promise and it seems like new ones are popping up here and there. 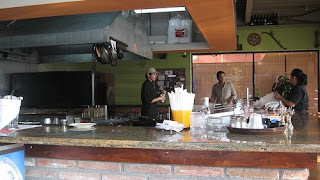 Palmuzul was another amazing concept, a restaurant that featured Baja cuisine from Tijuana to Cabo. I went there about a half dozen times, from the start it was executing all its dishes so well, but then the menu shrank, and so did the quality.They lasted maybe a year.In time, La Querencia and others will yield some other breakaway operations as the young chefs become more confident. The quartet of salsas from nice to wicked at La Querencia and Baja Med Pizza Co.
Years ago, Villa Saverios featured a more Mediterranean and Italian menu, one of the best restaurants in Baja by chef and restauranteur, Javier Plascensia. But, the movement is infectious. Over the years the menu changed to reflect his own Baja style dishes and sensibilities. They used to serve Baja quail, an iconic dish from the region, and their version had the feel of the street grill, but with a touch of sophistication .You can have a tasting of local shellfish prepared in a variety of ways. Baja scallops, oysters, abalone, or the prized chocolata clams. Order the local Real del Castillo cheese selection to have with a bottle of wine from El Valle de Guadalupe.The other day we tried the chile relleno stuffed with pasta in four cheeses with a huitlacoche emulsion and a traditionally styled tomato sauce. A beautiful representation of the Baja Med imagination.The cooking at Villa Saverios is stellar. To include an Asian touch, a tartar of blue fin tuna is dressed with ponzu in a jalapeno and sea urchin sauce--heavenly. How about a quail and duck pate made with Mexican port wine? The grilled baby octopus, the lamb shank tacos are delicate but full of flavor. There's traditional Italian and Mediterranean here,too, but keep your eyes on that menu. Baja treasures await. Villa Saverios, where Javier Plascencia's journey began in the heart of Tijuana's gastronomic zone. Miguel Angel Guerrero, the man who actually patented the term Baja Med, is the movements heavy weight champion. A hunter, and chef, realizes this fabulous cuisine at his La Querencia in Tijuana, and El Aljibe(closed in 2009) in La Paz. His cuisine screams of terroir. 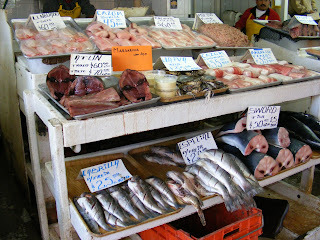 Local game, local catch, and the influences of Mediterranean and Asian immigrants. 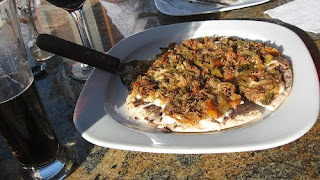 Unlike California cuisine which also emphasizes Mediterranean influences and local ingredients, Baja Med has dishes and ingredients that are entirely unique to its region. To this day I can't yell out a California cuisine dish even though I've been to the restaurants and looked through a few cookbooks. 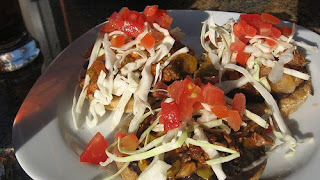 But hijole, chorizo de abulon on a sope, forget about it--that's Baja Med. Duck tacos, Miguel Angel's sashimi a la Querencia of scallops with Asian sauces,venison tacos, manta ray sopes,or the local farmed beef in the Valle de Guadalupe, not to mention olive oil and cheese made in the region--these are becoming a standards. One evening consisted of a special clam au gratin on a bed o sea salt, and the stuffed bacon wrapped shrimp covered in a long thin tube of machaca de marlin, accompanied by fresh grilled vegetables with some Asian flavors thrown in. Dark and rich flavors, brilliantly paired. 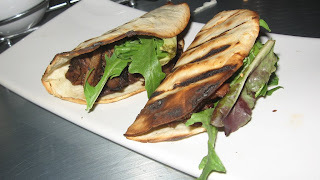 The marinated duck tacos and chorizo de abulon tacos are served in an original tortilla: thin and crispy. Were not just changing the tires here, this is a culinary overhaul from top to bottom. 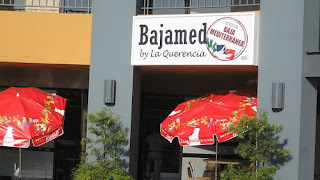 With his El Aljibe in La Paz, Miguel Angel covers Baja on two fronts in his campaign to spread the word about Baja Med. La Querencia is a must for the Baja traveler. 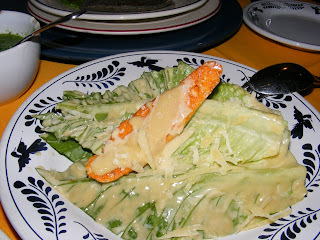 Other restaurants have there Baja Cuisine touches, all of them do a Caesar's salad. La Diferencia has an octopus dish that leans towards a more local style. And everyone in Tijuana's gastronomic zone is serving Baja wines. The vineyards of the Valle de Guadalupe drive the gastronomic movement. From the vineyards and farms, to the innovative chefs, Baja Cuisine continues to grow and develop its dialect. It's real and it is here to stay, the culinary schools are prepping the next generation, and the kitchens of Baja Cuisine restaurants are training the young talented recruits. The Valle de Guadalupe and Baja peninsula have found a worthy cuisine to express its diversity and iconoclast character. You forgot to mention Ristorante Italianissimo, the only true italian restaurant in Tijuana. Italianissimo is great, but I was writing about the Baja Med movement which is Mexican cuisine for this post.Congratulations on your restaurant. thank you for lesson shifu! Guerrero invented a term, thats all, there where many other chefs doing Baja Mediterranean cuisine way before him. Here in Baja, he is not considered the originator, or even one of the top chefs. What he does have, is the best PR department. He has a trademark, thats all. Hey anonymous, although I have an idea who you are.The Baja Med or Baja cuisines have roots that precede La Querencia, and I think I covered that in the report. 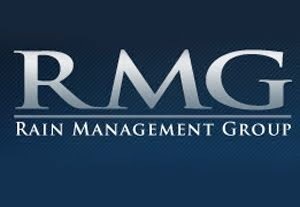 Being one of the few modern pioneers in this movement,dedicated to its future development, and the guy who patented the term give him relevance beyond any subjectivity. I respect all people involved in this quest for a regional Baja cuisine. From the Taco stand vendor, to Benito Molina who is a great chef. I just don't feel its fair, or accurate, for anybody, to give out interviews and or make publicity saying many people are "following" "his" cuisine. I personally know many chefs who where working hard on developing this cuisine, way before Guerrero was even a chef, people like Molina, Plasencia, Tellez, etc etc I was inspired by them, and feel they are being disrespected by this false claim. They are such great chefs that they do their food do the talking. If Guerrero wants to issues statements claiming he trademarked Bajamed, thats great and good for him. But i feel someone has to speak out, because all the great chefs in Baja are too classy to say anything in public. Just be fair and let your food do the talking. Anonymous,are you the editor for Sr. San Roman's cookbook? Very similar commentary. Benito Molina is one of the best chefs in Mexico, period, and a good friend. He doesn't consider himself Baja Med, neither does the great Javier Plascencia, who characterizes his cuisine as Baja cuisine. Jair does his own thing as well. These are all different chefs with different styles. Let's respect all these great chefs, and that includes you, too.Jair, Benito, Javier, and Martin all have deserved accololades and esteem.They aren't worried about La Querencia. I enjoy all these chefs but Benito and Javier are stars in my book. Love their cooking and was at Benito's Manzanilla and Javier's Campestre during Vendimias.Brilliant! I haven't had the pleasure of meeting San Roman. I am involved in this effort, but i work in a city outside Baja Norte. I love Benitos Creativity and Javier's flavors, Jair does his own thing and he works with marvelous ingredients. Theres guys like Otto from Otto´s grill who i respect, and many other people who are quietly doing great things. La Querencia's food isnt an issue for me, but the ads, oh the ads! it really gets you angry when somebody claims in ads and interviews that "he came to bring that food", and that "he is glad many are following him". When you know others have been working hard years before a trademark. Saludos!! Understood. Well, I can assure you that I'm dedicated to highlighting the region and all its great chefs and restaurants. I don't care about slogans or pitches, it's about the food, whether it is first, delicious, and second, relevant.Saludos y mucha suerte.